Zuill Bailey, one of the world's premiere cellists, performs acclaimed American composer Nico Muhly's Cello Concerto -- A world premiere recording performed with the Indianapolis Symphony conducted by Jun Märkl. Originally commissioned by the Barbican, the work received its American premiere with the Indianapolis Symphony in 2013 and that performance is the source for this recording. Also included on the album are two works by the great Swiss composer, Ernest Bloch: the Hebraic Rhapsody for Cello and Orchestra, again featuring Zuill Bailey as soloist, and the Three Jewish Poems for Orchestra. Zuill Bailey opens this triptych with a superb account of Bloch's masterly Schelomo, concentrated Read more and powerful, the soloist rhapsodising in a freely expressive style. Jun Markl draws from the Indianapolis Symphony Orchestra a partnership of great sensitivity and colour, and this makes a perfect prelude to Nico Muhly's Cello Concerto which follows. This original and inspired work receives its world premiere recording here. The cello begins a long, intense soliloquy against bold string-pizzicatos, which are taken over first by the orchestra, then the percussion, strongly directed. This leads to a brief moto perpetuo from the cellist. The orchestral playing softens in feeling and dissolves downwards without a break into the delicately scored, tense second movement. It becomes one long lyrical drone and ends with 'a shimmer of bells and rude brass'. The mood lightens engagingly in the finale as Markl combines bold rhythms in the orchestral bass, with chirping minimalist woodwind, creating two lines of counterpoint. The concerto closes enigmatically, with the drums and growling brass returning and another sustained drone again superbly controlled by Markl, yet led by the cello. Bloch's Three Jewish Poems of 1911 and 1916 return to the opulence of the orchestral writing of his early period. The first, 'Danse', balances rhythm and colour. The second, 'Rite', in the composer's words, 'is more emotional' but 'there is something solemn and distant'. The third,'Cortege funebre', 'is more human' and dedicated to his father's memory. Both soloist and conductor show their control with great intensity of feeling throughout, superbly recorded. "Bailey's playing is rhapsodic, and his Solomon sounds genuinely profound, brooding, and sorrowful. Everything about the soloist's performance and the orchestral accompaniment seems letter-perfect to convey Bloch's despairing moods and tone shifts. This is, in fact, one of the most-powerful readings of the score I've heard, powerful emotionally as well as powerful musically... One of the finest production teams in the country made the disc... The sound is, in a word, superb. It's as realistically natural as you could want, with both the cello and the orchestra appearing to be in the same room with you. There's an almost startlingly lifelike quality present, the strings vibrant, the cello rich and mellow, the midrange transparency excellent, the air and space and ambience just right. Highs are well extended; bass is deep and solid; dynamics are strong and wide; I could go on. Suffice to say, this is among the best-sounding new recordings I've heard in quite a while." "Cellist Zuill Bailey...and the Indianapolis Symphony orchestra, under the baton of conductor Jun Märkl, deliver a magnificent live recording of music by Nico Muhly and Ernest Bloch...Bailey’s cello performance is emotionally powerful, convincing, melodic and reveals his superb lyricism.Overall, the Muhly & Bloch recording beautifully reveals Zuill Bailey’s virtuosity as a cellist and gives this gift of music exceptional clarity. With its excellent sonorities and great technical and production values, it is a recording that skillfully documents Bailey's amazing technical facility and flawless command of his instrument." 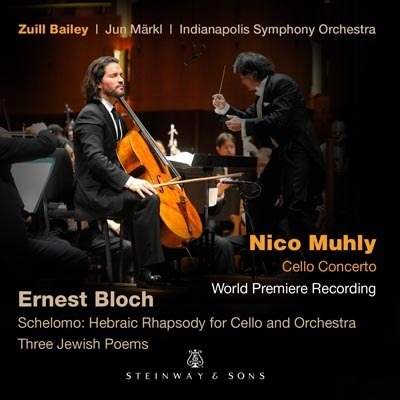 "So superb and sturdily popular is the “Jewish Cycle” of cello music by Ernest Bloch (along with the cello music of Benjamin Britten, probably the fithat it is ideal for presenting, in its midst, a brand new 18-minute cello concerto by 33-year old composer Nico Muhly. Bailey’s...performance of Bloch’s terrific music for cello and orchestra is in the grand tradition. The Indianapolis Orchestra is exemplary too." The Steinway & Sons label broadens its range a bit here with a live recording featuring the underrated Indianapolis Symphony Orchestra under conductor Jun Märkl, with one of the hot American soloists, cellist Zuill Bailey. The Jewish-themed works of Swiss-American composer Ernest Bloch, nearly 100 years old when this album was released in 2014, have never failed as crowd-pleasers or gone through a spell of unpopularity; the Three Jewish Poems are only slightly less familiar than the ubiquitous Schelomo: Hebraic Rhapsody for cello and orchestra, with its shofar-like calls and rich melodies. Bailey delivers big performances of these in the classic mold, and while there are classic renditions to choose from if choosing just one, this would also fill the bill. The novelty here is a new work by American composer Nico Muhly, who has mostly specialized in choral pieces. His three-movement cello concerto, compact at about 18 minutes, almost sounds like choral music, especially in the high-lying, genuinely ethereal slow movement. That makes sense, for Schelomo itself started life as a vocal piece and was then recast for the cello. This is a much more coherent way of including contemporary music in a program than American orchestras usually provide, where the contemporary piece is so often something listeners sit through in order to get to the Beethoven. Steinway gets fine live sound out of the Hilbert Circle Theater in Indianapolis. Period: 20th Century Written: 1915-1916 USA Date of Recording: 1/24-1/26 2013 Venue: Hilbert Circle Theater, Indianapolis Length: 22 Minutes 6 Secs. Date of Recording: 1/24-1/26 2013 Venue: Hilbert Circle Theater, Indianapolis Length: 17 Minutes 45 Secs. Period: 20th Century Written: 1913 Switzerland Date of Recording: 1/24-1/26 2013 Venue: Hilbert Circle Theater, Indianapolis Length: 24 Minutes 4 Secs.